Most kids know what THEY want for Christmas, but here’s a fun activity to get them thinking about what might be a nice gift for someone else this festive season. 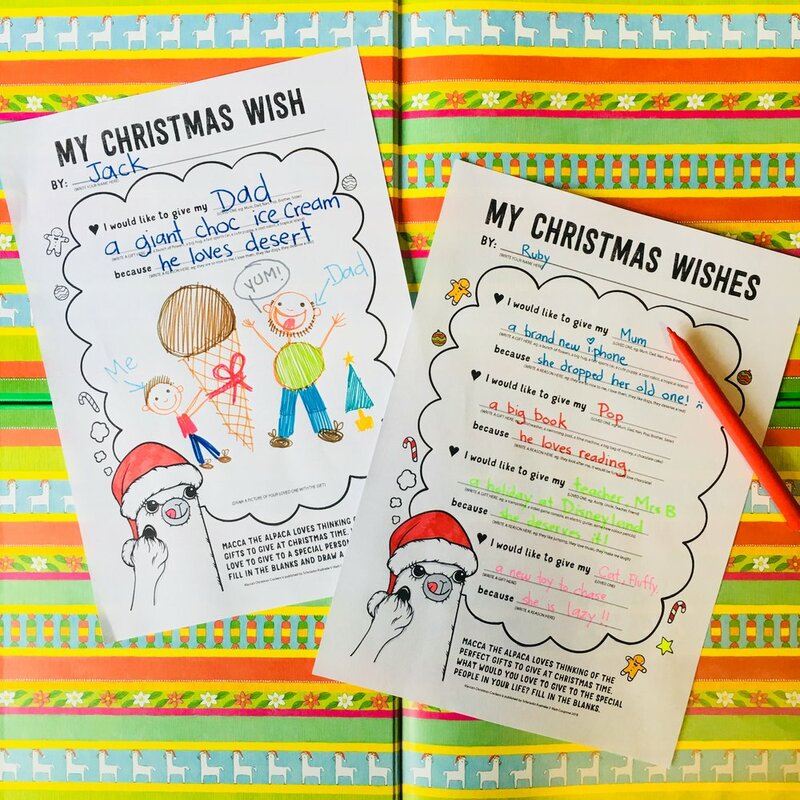 In Macca’s Christmas Crackers, Macca loves thinking of the perfect presents to give to his friends, and this little exercise lets children imagine what they could give to the loved ones in their life. No limits and no budget! It’s totally up to them and their imagination. It really is the thought that counts, so these wishlists could make a perfect present to give to friends and family for Christmas when the piggy bank is empty. I’ve always loved a good find-a-word puzzle. I’ve made up two based on Macca’s Christmas Crackers for any teachers, librarians, families or kids who also enjoy them. Macca the Alpaca’s Christmas Find-A-Word is probably better suited to younger children. Harmer the Llama’s Christmas Drama Find-A-Word is a little more challenging for the older kids. The words can run across, up, down, diagonally, forwards and backwards. Have fun! Make your own cracker ‘Macca The Alpaca’ Christmas card! Just print out the template below and follow the easy steps to create your very own personalised ‘Macca’s Christmas Crackers’ card, coloured-in with love. It’s fun, festive and, best of all, free! Merry Christmas! !